If someone mentions flooring, you might picture plush carpeting, striking tile, or rich hardwood. But, when it comes to installing new floors, it’s what’s inside (or, technically, what’s underneath) that counts. Beneath the flooring you live with day-to-day is what construction pros call a subfloor. This first layer of material that sits on top of the floor joists is designed for function. It provides a crucial, flat, structural foundation beneath your actual flooring and is usually made of plywood (or concrete, if you have a slab foundation). As a homeowner, when you’re interested in getting new floors, the quality of your subfloor makes a big difference. 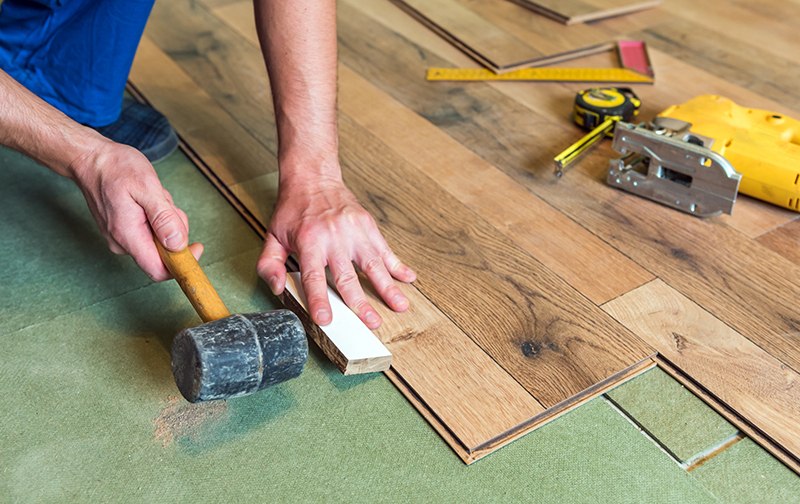 Even though the subfloor layer isn’t visible once your new floors are installed, its condition will make—or break—the installation process because you can’t put in new flooring on top of sub par subfloors. A good subfloor is a hard worker, protecting your flooring and acting as a barrier to the outside world. It protects against water damage, helps floors last longer, and makes them even and flat. Subfloor vs. underlayment: You may have heard your installer refer to an underlayment. The underlayment is another protective barrier that is sometimes laid between the subfloor and your flooring. It provides additional leak protection and serves as a sound barrier. Clean: Clean your subfloor by removing loose debris, including any glue, underlayment, carpet tackstrips, and more. If your flooring is being installed by Kermans, our team will make sure that your subfloor is pristine before installing your new flooring. Smooth: For optimum installation and consistent flooring, you need a subfloor that is flat and smooth, especially if you’re installing new hardwood or tile. Structurally sound: If there is rot or loose pieces in your subfloor, your new flooring won’t be solid underfoot. Avoid squeaks and a spring-y feel when you walk on your new floors by making sure your subfloor is structurally sound before laying your new flooring. Dry: Ensure that your subfloor is dry, and you don’t have any no water leaks that could cause problems, either during flooring installation or down the road. A dry subfloor at the time of installation is also a must-have to ensure mold or mildew don’t begin to grow underneath your floors! Investigate if you don’t see any moisture but smell something acrid or musty. This may be due to mold growth that isn’t visible. Level: No one wants new floors that droops. If your subfloor is level, your flooring will be level. Level floors make installation go well, and the end result is smooth flooring that looks great. Since the subfloor is hidden beneath your current flooring, determining its condition of the subfloor can be difficult until your current flooring is removed. While preparing your home for new flooring, if possible you should always examine the subfloor. Unless you live in a brand new house, your home likely has some “character” from years of love, and sometimes it’s that “character” that makes projects like installing new flooring more difficult than originally anticipated. It’s always smart to expect the unexpected. That means planning some extra padding into your new flooring budget, just in case subfloor problems are found during the renovation process. If your flooring installers remove the old flooring and find that your subfloor is in less-than-ideal condition, now is the time to make it right. Installing a new floor on inadequate subflooing puts your new flooring at risk for damage, and it is not a good long-term solution for your home. If your Kermans Flooring installers discover a problem with your subfloor during installation, we will notify you immediately. Kermans is equipped to handle certain types of subflooring repairs, and we can provide a quote for your consideration on the cost to do any repair work before proceeding with the installation of your new flooring. For other more complex subflooring repairs, including those tasks that involve plumbing or electrical work, our installers recommend hiring a licensed contractor who specializes handling any of these sort of more complicated repairs. Addressing your subfloor problems promptly and with the right team of experts results in subfloors that are in the best possible condition so don’t forget to keep in mind what lies beneath when you plan your next new flooring project.